We recently had the opportunity to participate in field leader training through the Outdoor Council of Canada. This was a weekend course combining their Field Leader (Hiking) certification with their Winter Leadership module. We learned about the course through Hike Nova Scotia, who partners with the Nova Scotia Chapter of the Outdoor Council of Canada to bring this training to the province. Field Leader (Hiking) is a nationally-recognized, “entry level program that trains and certifies people to become leaders of single day events in low-risk terrain under the supervision of others”. The winter module expands the certification into winter terrain. The only prerequisite for the course was, “a love of the outdoors and a passion to share that experience with others”, and this seemed like a good place to start. Wade has been planning group hikes and backpacking trips for some time now and we have recently started hosting “Backpacking Basics” discussions on a variety of topics through the Halifax Adventure Seekers, which we designed as an opportunity for people interested in backpacking to come together and learn from each other’s experiences. We decided to take the course because it looked like it contained a lot of practical information, but also to a large degree out of curiosity. 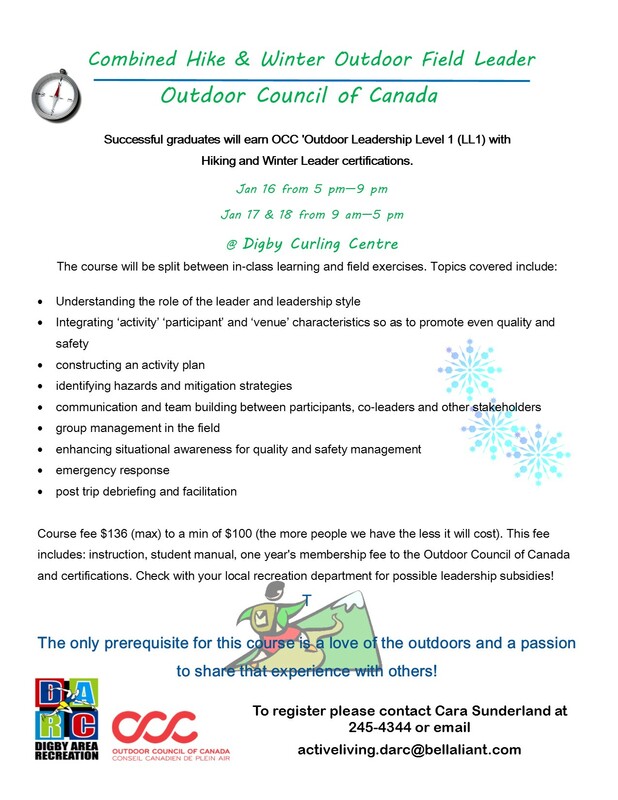 Opportunities for outdoor recreation courses can be few and far between and we had stumbled onto the OCC website previously, but couldn’t quite understand exactly who the organization represented and what its mandate was. The course was hosted by Digby Area Recreation. Digby is small town about a 2.5 hour drive from Halifax, along the shores of the Annapolis Basin and located within the Southwest Nova Biosphere Reserve, a UNESCO designation. Neither of us had spent much time in this part of the province before, although nearby Brier Island has been on our list for a few years. Our instructor Anjeanette was able to relate a lot of the course information to her own wealth of experience as an Outward Bound instructor which made the classroom time interesting and enjoyable. The 5 other participants were all from the Digby area and had a wide variety of backgrounds and reasons for taking the course, which added to the group discussions. The two field exercises added a nice, though rather cold, change of scenery. The first exercise was a short snowshoe along the coast near the Point Prim lighthouse. It was icy cold and the wind was intense, so we stuck to the more sheltered route, venturing out to the exposed shore on a few occasions. We identified various features of the trail and how they relate to the OCC’s “matrix” which groups hiking terrain into one of three classes designed to represent increasing levels of potential risk. Sunday’s hike was a somewhat longer snowshoe at the Digby Pines Golf Club. It combined the field leader training with a public event offered by the Fundy Erratics hiking group, and was an opportunity to put into practice some of the skills we discussed in the course. It also included a “show and tell” about winter clothing layering systems at the mid-hike break. And finally as a huge bonus we learned about some great on-trail and off-trail destinations in that part of the province, so hopefully we’ll be able to get back for some warmer-weather hiking! ⇒ Interested in taking this training? Hike NS and OCC both have lists of upcoming courses on their websites.